1 Arrangement Grape-like clusters. A chain of round cells. 2 Division Staphylococci divide in various directions (multiple axes). Division occurs in one linear direction (single axis). 4 Enriched Media Staph does not need enriched media (not fastidious). Strep needs enriched media (fastidious). 5 Habitat Staphylococci are found on the skin. Streptococci are found in the respiratory tract. 6 Hemolysis No hemolysis or beta hemolysis. Either alpha, or beta or gamma hemolysis. 7 Species Number About 40 staphylococcal species have been identified so far. About 50 Streptococcal species have been identified so far. 8 Pathogenesis Most of the staphylococcal species are non-pathogens. 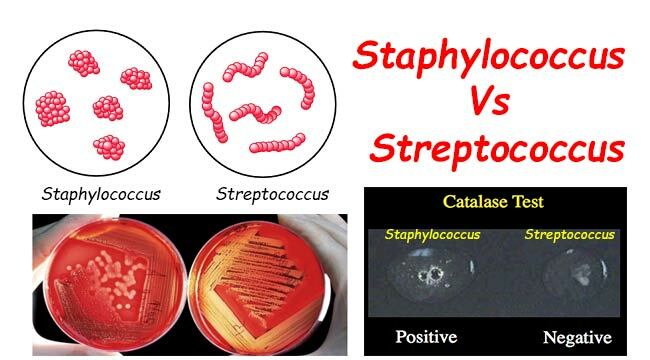 Streptococcus cause many diseases.